Abstract: Who doesn't like to see the coolest gadgets to hit the high-tech market? I know we do! We've compiled a gallery of the coolest innovations that caught our attention at COMDEX 2000.
Who doesn't like to see the coolest gadgets to hit the high-tech market? I know we do! We've compiled a gallery of the coolest innovations that caught our attention at COMDEX 2000. Most of these devices are still in the prototype stage, but a few, like the Sony devices are scheduled to become available rather shortly. There are over 35 products from at least a dozen of the top technology companies shown here, mobile devices, cell phones, MP3 players, laptops, heatsinks - just about everything.... enjoy! 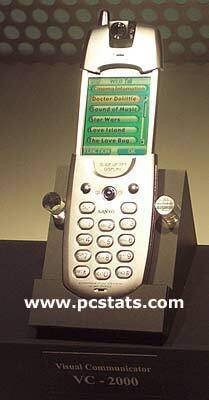 Mobile web-enabled devices were the hottest area for most of the manufacturers at COMDEX 2000. 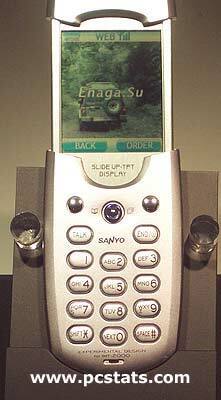 This functional unit from Sanyo (the VC-2000) sports a reflective colour LCD screen about the size of a credit card. The phone can be collapsed to protect the screen, and a built-in CMOS camera enables pictures to be transmitted by the user. Reflective LCD screens use the ambient light to illuminate the display. Another image of the VC-2000 shows closer detail of the keyboard and image capabilities of the screen. Note the compressed keyboard function keys in the keypad. Typing in an email would no doubt be a slow and tedious process.